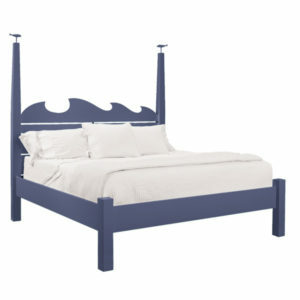 The High Tide Bed introduces a bit of coastal whimsy with a wave headboard on a classic post bed. Delightful fish finials are the pièce de résistance for this oh-so-nautical slumber retreat. Available in multiple colors and sizes. All bed sizes are 80″ High. Furniture designs and building methods are both based on classic Shaker furniture styles and techniques. Each piece of painted furniture is bench built to order by an experienced woodworker in America.